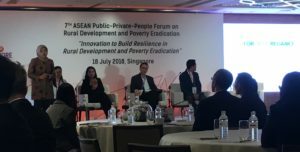 The 7th ASEAN Public-Private-People Partnership (PPP) Forum was organised by the Ministry of Social and Family Development of Singapore on 18 July 2018 at Grand Hyatt. Asia Philanthropy Circle (APC) CEO Laurence Lien moderated a session that featured the three finalists of the ASEAN Social Impact Awards. They were consistent in their message of needing to create community ownership and to empower communities to be part of the solution, and not just be a recipient of aid. Laurence also spoke on “The Role of Philanthropists in Collaboration and Partnerships for an Innovative and Resilient ASEAN”. Laurence said the intention behind establishing APC was to work with philanthropists in a collaborative manner and the credibility of the organisation lies in the willingness of members to work together as a group. He highlighted the current members’ enthusiasm to work in coordination defies the common view that philanthropists prefer to work in silos. Laurence listed a range of events in ASEAN Public-Philanthropic collaborations (PPC) like awareness generation, information sharing, outsourcing technical assistance and co-implementation of activities. He concluded his presentation with the inaugural ASEAN Philanthropy Dialogue organised by APC and the partnership approach embarked in the ‘1000 Days Fund’, which is addressing the issue of malnutrition and stunting in Indonesia. The Question and Answer (Q&A) session involved participants posing questions on measures to tackle corruption in ASEAN and finding a suitable candidate to work in the sector. Laurence responded that finding the right executors has been a challenge and the lack of funds is not always the problem but rather, allocating money to the right activities. Funders have to invest in social entrepreneurship and one of the ways to tackle corruption is through technology. Overall the ASEAN PPP Forum was an insightful, knowledge sharing platform that included participants not only from diverse professional backgrounds but also students from junior college, under-graduate and graduate programmes from different universities and schools in Singapore. The diversity of the participants was also reflected in the Q&A sessions where the topic of the questions varied from identifying community-based talent, role of government in encouraging community-based collaborations and activities, and the need for inspiring millennials to choose the path of social sector.